Sen. Kirsten Gillibrand has been reaching out to Wall Street executives about supporting a potential 2020 run for president. Gillibrand has gotten a mixed response from the executives. The New York Democrat's effort comes as she contemplates entering what will likely be an expensive and protracted Democratic primary. Sen. Kirsten Gillibrand, D-NY, is reaching out to Wall Street executives to gauge potential support if she were to run for president in 2020, CNBC has learned. Gillibrand has personally been working the phones and calling senior executives at Wall Street firms in recent weeks to see whether they would back her campaign if she jumps into the race, according to two senior business leaders who spoke on the condition of anonymity. Donors in the financial community helped back Gillibrand's successful re-election bid last year. Her effort to connect with business leaders this time comes as she contemplates entering what will likely be an expensive and protracted Democratic primary. Gillibrand has gotten a mixed response from the executives, however. Some have enthusiastically kept the door open to helping her finance her possible 2020 operation while others are hesitant to return her calls. A few business leaders and other Democratic Party donors have been privately critical of Gillibrand's early efforts to force the resignation of former Sen. Al Franken of Minnesota, according to one of the sources familiar with the discussions. Gillibrand was the first Democratic senator to publicly call for Franken, a fellow Democrat, to resign after he was accused of sexual harassment by multiple women in 2017. "While Senator Franken is entitled to have the Ethics Committee conclude its review, I believe it would be better for our country if he sent a clear message that any kind of mistreatment of women in our society isn't acceptable by stepping aside to let someone else serve," she said at the time through a Facebook post. Gillibrand's comments led to several other women in the Senate demanding Franken to step down, including at least one other prospective 2020 presidential candidate, Sen. Kamala Harris, D-Calif.
Franken supporters in the business community argue Gillibrand should have allowed the eventual Senate Ethics Committee investigation to conclude before rushing to demand the resignation of the Minnesota lawmaker. They also believe he was a champion for women during his time in the senate. Even though Gillibrand has received donations from Wall Street, she has pushed for tightening regulations in the financial industry. She voted in support of the Dodd-Frank Wall Street Reform and Consumer Protection Act and then voted against a bill in 2018 that rolled back some bank regulations put in place in 2010. As a member of the House of Representatives, she voted against the bank bailout during the 2008 financial crisis. Glen Caplin, a spokesman for Gillibrand, insisted that if the lawmaker from New York ran for president she would build her operation off of grassroots fundraising and would not confirm or the deny her efforts to reach out to Wall Street leaders. "If Senator Gillibrand decides to run, she will run a campaign that takes no corporate PAC money and is powered by grassroots donations, and based on her values of standing up to those in power and returning our democracy to the people where it belongs," Caplin said in a statement to CNBC. Later Gillibrand responded to this story in a tweet, noting her voting record on financial regulations. She did not deny having conversations with Wall Street executives about a possible 2020 run. The post was later deleted from her Twitter account. 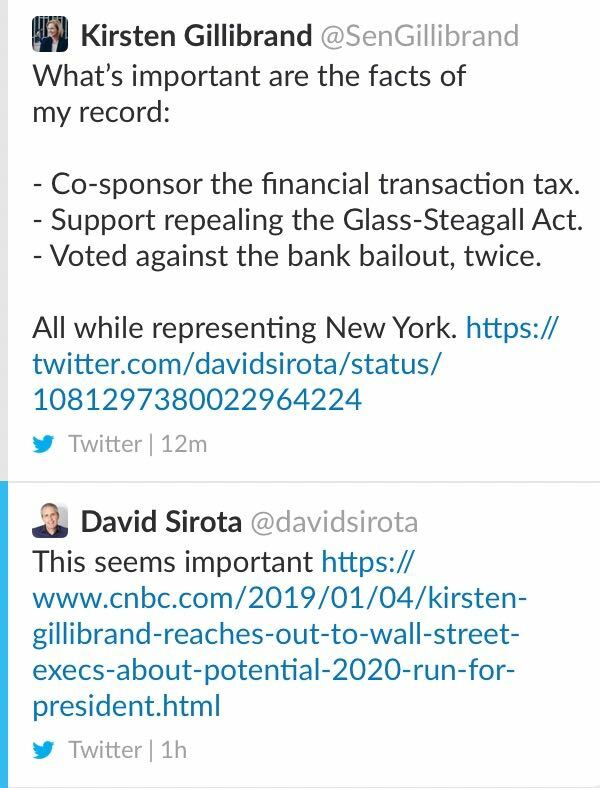 Gillibrand later re-posted her response on Twitter, clarifying her position on the Glass-Steagall Act, saying she supports re-instating a new version of the law. What's important are the facts of my record: - Co-sponsor of the financial transaction tax. - Support reinstating a new Glass-Steagall Act. - Voted against the bank bailout, twice. All while representing New York. Gillibrand, who is known as a prolific fundraiser in the political donor world, raised just over $1 million from the securities and investment industry during her 2018 campaign, according to the nonpartisan Center for Responsive Politics. Lawyers and law firms gave $2.2 million to back Gillibrand's campaign. She finished the cycle raising $17 million and has $10 million on hand. Still, turning to Wall Street investors and business titans could be a risky tactic in the next election, particularly after Sen. Elizabeth Warren called on 2020 hopefuls to stay away from political action committees, say "no to the billionaires" and to focus their efforts on fundraising through the grassroots community. Warren, a frequent Wall Street critic who announced an exploratory committee for president last week, has been following her own advice and recently started shuttering her own joint fundraising committee, which allows megadonors to write six figure checks in support of candidates for public office. Others who have said they're considering running include former Vice President Joe Biden, Texas Rep. Beto O'Rourke, and Sens. Amy Klobuchar and Cory Booker. Nationally, Gillibrand is not faring well in early polls. According to a recent CNN poll, she garnered 1 percent of the vote after participants were asked who they preferred to carry the party mantle in 2020. She is not doing much better in the early caucus state of Iowa. A CNN/ Des Moines Register/ Mediacom poll shows she only picked up 1 percent of the vote from likely Democratic caucus voters in the state. Iowa's caucuses will kick off the presidential contest season in January 2020. While it is too early to tell who will pull off a victory in two years, the surveys suggest that Gillibrand has a long way to go to appeal to a national audience.